Terence James Cooke (March 1, 1921 – October 6, 1983) was an American cardinal of the Roman Catholic Church. He served as Archbishop of New York from 1968 until his death in 1983. He was elevated to the cardinalate in 1969. The youngest of three children, Terence Cooke was born in New York City to Michael and Margaret (née Gannon) Cooke. His parents were both from County Galway, Ireland, (his father from Abbeyknockmoy), and they named their son after Terence MacSwiney, the Lord Mayor of Cork who died on a hunger strike during the Irish War of Independence. His father also worked as a chauffeur and construction worker. At age 5, he and his family moved from Morningside Heights, Manhattan, to the north east Bronx. 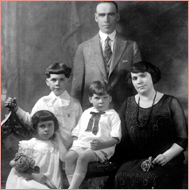 Following his mother’s death in 1930, his aunt helped raise Terence and his siblings. Cooke, after expressing an early interest in the priesthood, entered the minor seminary of the Archdiocese of New York in 1934. In 1940, he entered St. Joseph’s Seminary in Yonkers. 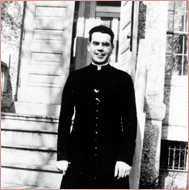 Cooke was ordained a priest by Archbishop Francis Spellman on December 1, 1945. He then served as a chaplain for St. Agatha’s Home for Children until 1947, when he moved to Washington, D.C., to pursue his graduate studies in social work at the The Catholic University of America, from which he obtained a Master of Social Work degree in 1949. After he returned to New York, Cooke was then assigned to serve as a curate at St. Athanasius Parish in the Bronx, while also teaching at Fordham University’s School of Social Service, until 1954, when he was appointed Executive Director of the Youth Division of Catholic Charities and procurator of St. Joseph’s Seminary. 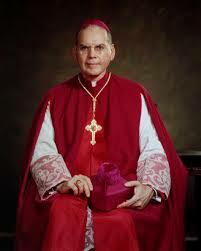 In 1957 he was appointed by Cardinal Spellman to be his secretary, a position in which he remained until 1965. Cooke was named a Privy Chamberlain of His Holiness on August 13, 1957, and Vice-Chancellor for the Archdiocese in 1958, rising to full Chancellor in 1961. On September 15, 1965, Cooke was appointed an auxiliary Bishop of the Roman Catholic Archdiocese of New York and titular bishop of Summa by Pope Paul VI. He received his episcopal consecration on the following December 13 from Spellman, with Archbishops Joseph Thomas McGucken and John Joseph Maguire serving as co-consecrators, at St. Patrick’s Cathedral. He selected as his episcopal motto: Fiat Voluntas Tua, meaning, “Thy Will Be Done” (Luke 1:38). Cooke played a prominent role in arranging Pope Paul’s visit to New York in October, and became Vicar General of the Archdiocese two days after his consecration, on December 15, 1965. He was diagnosed with acute myelomonocytic leukemia, a form of cancer, that year as well. 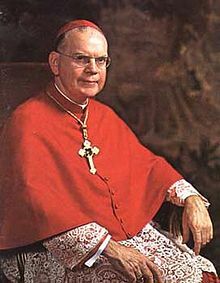 Following the death of Cardinal Spellman in December 1967, Cooke was named the seventh Archbishop of New York on March 2, 1968. Cooke’s appointment came as a surprise; likely contenders for the post included Fulton J. Sheen, a television personality and Bishop of Rochester; and Archbishop Maguire, who had been Spellman’s coadjutor but did not hold the right to succession. In addition to his duties in New York, he was named Vicar Apostolic for the U.S. Military on April 4, and was installed in both positions at St. Patrick’s Cathedral. That same day, Martin Luther King, Jr. was assassinated in Memphis, Tennessee, leading to a nationwide wave of riots in more than 100 cities. In response, Cooke went to Harlem to plead for racial peace and later attended King’s funeral. He baptised Rory Kennedy. In 1969, Cooke delivered the benediction at the inauguration of President Richard Nixon. Cooke helped implement the reforms of the Second Vatican Council in the Archdiocese, and adopted a more conciliatory managerial style than his predecessor, Cardinal Spellman. Pope Paul VI created him Cardinal-Priest of Santi Giovanni e Paolo, Rome (the traditional titular church of the New York archbishops) in the consistory of April 28, 1969. At the time of his elevation, he was the second youngest member of the College of Cardinals after Alfred Bengsch, who was six months younger than Cooke. Cooke was theologically conservative but progressive in secular matters. During his tenure as archbishop, Cooke founded nine nursing homes; Birthright, which offers women alternatives to abortion; the Inner-City Scholarship Fund, which provides financial aid for inner-city Catholic schools; an Archdiocesan Housing Development Program, providing housing to New York’s disadvantaged; and the Catholic New York, the archdiocesan newspaper. In 1974, he went to the Pontifical North American College in Rome, where he attended lectures on the Second Vatican Council given by his future successor, Edward Egan. His leukaemia was deemed terminal in 1975. Cooke was one of the cardinal electors who participated in the conclaves of August and October 1978, which selected Popes John Paul I and John Paul II, respectively. In 1979, he received the Dalai Lama and Pope John Paul II at St. Patrick’s Cathedral. In late August 1983, Cooke revealed his illness to the public; he announced that he was expected to live for a few more months, but would not resign his post. He was on almost constant chemotherapy for the last five years of his life. In an open letter completed only days before his death, he wrote, “The gift of life, God’s special gift, is no less beautiful when it is accompanied by illness or weakness, hunger or poverty, mental or physical handicaps, loneliness or old age.” Cooke died from his battle with leukaemia in his episcopal residence, at age 62. He is interred in the crypt under the altar of St. Patrick’s Cathedral. On April 5, 1984, President Ronald Reagan posthumously awarded Cooke the Presidential Medal of Freedom. In 1988, he was posthumously awarded the F. Sadlier Dinger Award by William H. Sadlier, Inc. for his outstanding contributions to the ministry of religious education in America. Cooke was widely regarded as a holy person by many New Yorkers during his episcopal ministry as Archbishop of New York and, soon after his death in 1983, a movement to canonize him as a saint began. In 1984, with the support of Cooke’s successor, Archbishop (and future cardinal) John Joseph O’Connor, the Cardinal Cooke Guild was established. In 1992, the Congregation for the Causes of Saints officially designated Cooke as a Servant of God, a first step in the canonization process that leads to beatification and then canonization as a saint. On the 14 of April 2010, Pope Benedict XVI was presented with the positio, the documentation on the cardinal’s life, work and virtues. The document was then given to the Congregation for the Causes of Saints to be examined by theologians. If the document is approved, Cardinal Cooke, who is currently a Servant of God, will receive the title of Venerable, the second step leading to sainthood. Wonderful web site. Lots of useful information here. I’m sending it to a few friends and also sending it to Granny who knew the Cardinal for many years in N.Y. She’ll be chuffed with this. Obviously, much thanks is due on your efforts! married I’ve never had the time to check it out. The site caught my eye because I pass the castle most days on my way to work in Athleague. Sometimes I go through Skehana when the road gets flooded. Keep it up!